Some politicians talk about having a spine of steel. I actually have one. 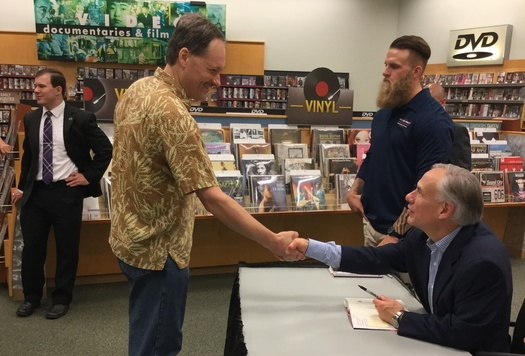 Shaking hands with the Governor at our local Barnes & Noble. This is a short and clearly heartfelt book. The first half is a sometimes touching, sometimes humorous account of his life from the freak accident that paralyzed him to winning the governorship of Texas. This part of the book is less about him than it is about his family, his friends, and his colleagues, who provided him the help and inspiration he needed to move forward. He talks about how his priorities changed from the moment of the accident. In the very beginning of the book, lying under the tree, he began to realize, through the pain, that he could not move his legs or feet. … I remembered watching a movie with my wife a year earlier about a man who had been paralyzed by an accident. At the time, I told my wife that if that ever happened to me, just put me to death. Faced with the actuality, however, he chose to focus not on what he couldn’t do, but on what he could. The second half of the book is a heartfelt appeal for the slate of constitutional amendments he’s proposed, Restoring the Rule of Law, with States Leading the Way. Whether you agree with them or not, it’s going to be hard to argue that he doesn’t have a deep respect for the constitution and what it stands for after reading these chapters. Dodd-Frank was intended to prevent banks from being too big to fail, and, hence, avoid the necessity of government bailouts. Instead, the high cost and heavy hand by which the regulations are imposed are leading to the opposite result: eliminating banks that are too small to succeed [under the greater regulatory burden]. Dodd-Frank has had the very predictable effect of increasing regulatory costs. Because of this, it privileges larger banks over smaller banks. Larger banks have more lawyers and bureaucrats to manage greater regulatory costs. This is, according to Abbott, exactly to be expected. It’s simply the nature of the system to perpetuate the system. The slate of amendments Abbott proposes are designed specifically to throw a wrench into the system, to make it work better for smaller, local businesses than for larger, national and multinational ones. By moving the levers of power closer to the people, the people can more easily access them. My own opinion going into reading this book is that I was unsure about the requirement of a supermajority on the Supreme Court to strike down “a democratically enacted law”. Part of our problem is the legal thicket that is the result of having too many laws; making it harder to get rid of some of them strikes me as the wrong idea. But all of the laws, including that one, I thought, would reduce unreasoning partisanship by bringing legislation closer to the people. After reading this I’m still unsure about the Supreme Court supermajority but I am even more in agreement with the rest of them. Abbott has clearly thought long and studied hard to find a solution to the problems we face at the federal level. They are definitely worth discussing. If you enjoy federalism, you might also be interested in Learning from alcohol prohibition, Should we hold regular elections for Supreme Court Justices?, and Dr. Frank N. Furter: the left’s answer to transgender bathrooms. If you enjoy Texas Plan, you might also be interested in The Texas Plan: Power to the People, Should we hold regular elections for Supreme Court Justices?, and ACLU calls for repeal of slavery amendments!. Governor Greg Abbott’s heartfelt appeal to break the system that paralyzes local businesses and that divides American nationally. Broken but Unbowed last modified June 30th, 2016.